Victory Motorcycles is announcing their intention to race at the 2015 Isle of Man TT Races fuelled by Monster Energy on a Victory electric race prototype motorcycle. The prototype electric race bikes will be piloted by William Dunlop of the legendary Dunlop dynasty and by Lee Johnston known in the racing world as "General Lee". Victory Racing will compete in the Isle of Man TT electric class, marking the first time that Victory Motorcycles has entered a professional motorcycle-racing event in Europe and raced an electric motorcycle. Parker, the world's leading diversified manufacturer of motion and control technologies and systems, is providing the race-proven, high performance GVM PMAC motors for both machines. "The entire Victory team is excited to make history with this effort," said Rod Krois, Victory General Manager. "We know that William Dunlop's experience and the continued Victory Motorcycles development of this electric race bike through work with Parker will propel us into a strong future with electric motorcycles." The SES TT Zero Challenge class event for electric motorcycles is a one-lap race round the island's 37.73 mile Mountain Course scheduled for Wednesday, June 10, 2015. "I'm more than excited to race this prototype at the Isle of Man," said William Dunlop. "Electric powertrains have many advantages, and the Isle of Man is one of the greatest tests in motorcycle racing." Lee Johnston will be riding the second entry for Victory Racing in the SES TT Zero Race and said, "I'm excited to make history by racing the new Victory electric race prototype. It's thrilling to be part of the emerging electric motorcycle movement." Ben Furnish, Marketing Manager for Parker Hannifin said, "Parker is thrilled to be involved with Victory Motorcycles in this historic event with these talented riders. We look forward to working with Victory to develop high performance powertrains for electric motorcycles. " 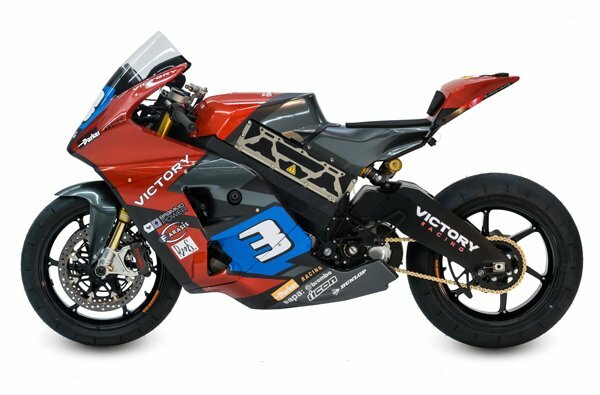 The Victory Racing prototype electric race bike features a dedicated electric racing motor and power cells as well as highly sophisticated electric controls to maximize the top power, power delivery, and durability under racing conditions. Victory engineers have further refined the electronics and chassis for the upcoming race with private test sessions in North America. Victory Motorcycles will host a continuous news feed of updates and photos from the Isle of Man TT and will have more information available on the Victory electric prototype race bike at http://www.VictoryMotorcycles.com. Be sure to follow Victory on Twitter @VictoryBikes and on Facebook at facebook.com/VictoryMotorcycles for additional updates.